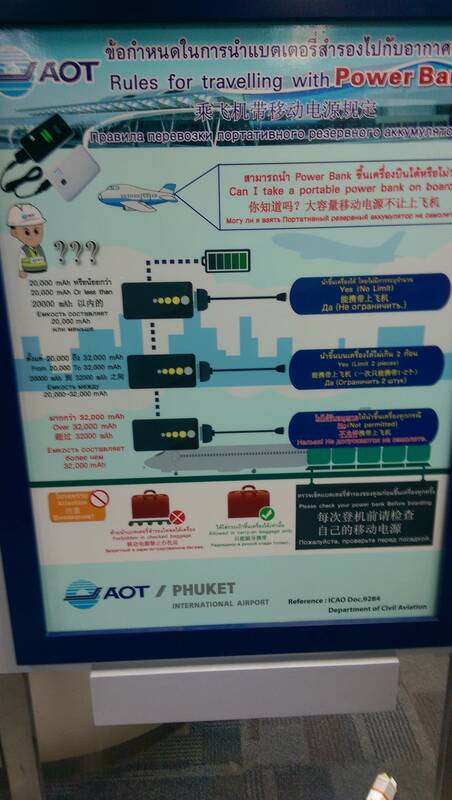 Or this might be a Thai aiports policy because I saw something on it at baggage carousel in BKK airport also. I was going to put this in my TR because it was a funny/bizarre story but it is also a good head's up. We were flying back to BKK from Samui on BKK Airways. We checked out bags and waited at the gate. My name was called and the girl asked me about items I checked in my bag. I didn't really understand her and she told me to follow her. And she was not nice at all! They took me to a buggy cart and whisked me away to cargo and they were all very serious. We get to the cargo and it was actually my wife's bag they were concerned with. Not so concerned that they allowed me to open it and not my wife! Well this girl went through everything..... I mean looked through all my wife's makeup bags. It was a portable battery charger my wife uses for her phone that was the concern. But the weird thing is that they wanted us to carry it on instead of checking it in. Isn't it usual that if they have concerns about items....they'd rather you check it in than carry on?? Regardless, be aware of batteries in your luggage....they weren't fcuking around!! Spare lithium batteries are not allowed in checked-in baggage. They must be carried as hand luggage only. Batteries pose a unique hazard during air transport and are capable of causing a fire if not transported correctly. We want to assist you to avoid carrying any batteries that are prohibited at law. If your flight is to or from the United States, penalties under US Federal law include fines of up to USD250,000 and even imprisonment. Please read the information on this page and also the Safe Pack website for more information about batteries and hazardous materials. Last edited by Hatari; 28th April 2016 at 15:52. Paul, you and Ao should have known about this as it's been widely reported over many years. Remember the Ethiopian 787 fire at LHR and MH370 suspicions re lithium cargo? It's worth noting that more pax will be caught out with DMK/BKK post check-in baggage screening systems. Good job by the staff for flagging that I say! I've been stopped a few times when going through security there as I have quite a large capacity power bank. They usually ask to see it, look at the capacity and then say ok sir no problem on your way. better to have the fire in the cabin where it can be dealt with rather than locked away out of sight. My wife and I didn't have a clue about what we needed to do. I still don't to be honest, but Moo's post makes sense. Better to have any sort of potential fire in the cabin than in the cargo area. If they have the "potential" to start a fire in either the Baggage area or cabin they should not be allowed onto the plane , full stop. Im sure people can live without their back up batteries for their Mobile phone untill they get to a power point on land...is face bloody book that important ? ^ same as smartphones though...same type of battery. I would have been ****ting it thinking if I had left a little spliff in some jean pockets or something. I've watch too many Banged Up Abroad! **** myself when I went to read my book at the pool at the hotel in BKK!